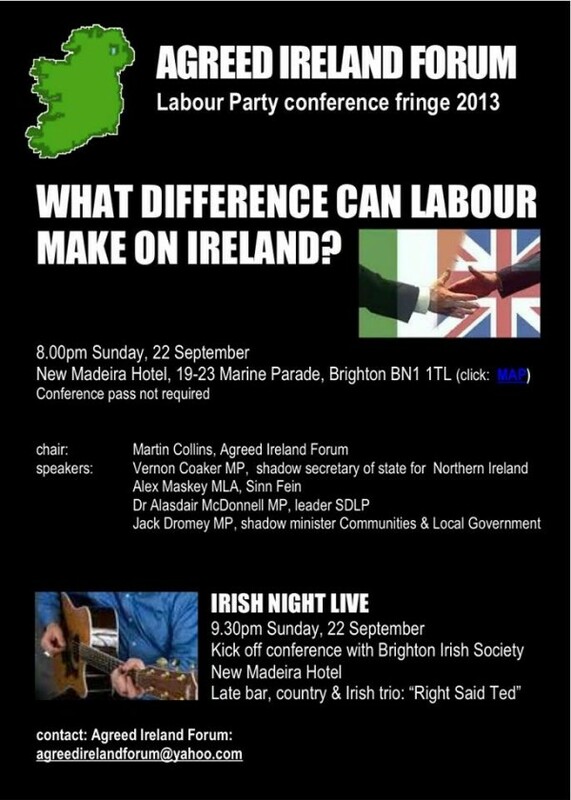 BRIGHTON IRISH SOCIETY is entertaining delegates at the Labour Party Conference — and you can be part of it. WHAT DIFFERENCE CAN LABOUR MAKE ON IRELAND? just ‘a stone’s throw’ from Brighton pier. This is a chance to hear a cross-party panel of speakers address the issue of party policy in the not so long build up to the 2015 General Election. Yes its IRISH NIGHT LIVE from 9.30pm and it features the talented Brighton trio, “Right Said Ted” . Includes a Late Bar where you can celebrate your winnings from the Dublin v Mayo All-Ireland football final earlier in the afternoon. (Dublin are presently 4/5 favourites).